You’ve got enough stress in your life right now. Skip the dealership — we’ll deliver your new car right to your door. Get Approved for Your New Car Today! At Automotive Fresh Start Center, we believe that challenged credit shouldn’t stand in the way between you and the car you really want. We specialize in helping customers get the vehicle that they deserve, whether they are still active in a Bankruptcy or have been discharged. If you don’t think you qualify for an auto loan from your Bank or Credit Union, don’t worry! Our lenders provide some of the best financing options available, and we are eager to share these opportunities with you, so that you can qualify for the car of your dreams. From the moment we opened our doors, Automotive Fresh Start Center has helped people with any type of credit issues get the vehicle they want & need, at a price they can afford. We just have a genuine desire to help our customers obtain the vehicle they want with the financing they can afford. We understand that life happens. We happily work with people struggling to build their credit, whether it’s from a past or current bankruptcy or a big debt burden. Our pledge is to have total transparency for our clients and the Lenders we work with. If you recently filed a Chapter 7, don’t give up on the thought of buying a car! We will work with you to help you get the right car at the lowest possible interest rate. As you make those affordable payments, you’ll rebuild your credit in no time. We all know that life happens. Sudden financial burdens, like getting laid off or getting hit with costly medical bills, can unfairly lower your credit score and force you into Bankruptcy. At Automotive Fresh Start Center, we want to look past that credit score to help you get that car you want, at a price you can afford. And with every low, monthly payment that is made on time, your credit score will rise. It can be hard to secure a good auto loan without any credit history, but payments on auto loans are a fantastic way to get your credit off to a fantastic start. Contact us and we’ll not only help you buy a car, we will also help you get a head start on your credit. We pride ourselves on quality service and a fast, easy purchase process. Our staff has years of experience assisting clients who are in the various stages of Bankruptcy. We work closely with the US Bankruptcy Courts and a number of professional Attorney’s who will work with you to get you on the road to recovery while we begin the process to get you loan approved in just a few short days. You likely believe that once you declare bankruptcy, you will have a hard time qualifying for an automobile loan. 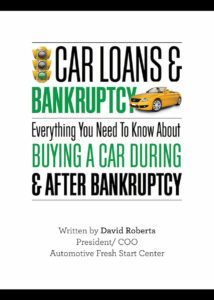 Our eBook with walk you through everything you need to know about buying a car during and after bankruptcy. Learn about your options so you can make the best decision for your circumstances.